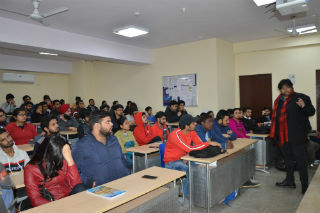 A pre placement activity was organized by Jagan Institute of Management Studies, Sector 5, Rohini, Delhi on 25th January, Friday, 2019 on the topic “How to improve interview performance”. Large number of students from the final year were a part of this enlightening session to learn about the important aspects of interviews, the skills required and how to ace them up. 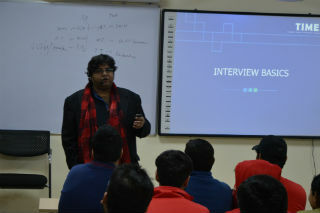 The session was taken up by Mr. Ravi Manoram from TIME Education Pvt. Ltd. He is an alumnus of Delhi college of Engineering and FMS, Delhi University. In the former part of the session he talked about the various aspects of interviews, why they are held, how they take place and how to go about them. It also included, the types of interviews, their duration and the evaluation that an interviewee goes through. As the session grew intense the preparatory aspects were unfolded, as in how to dress up for interviews, credentials that you need to carry, the steps than an interviewee needs to pass through and more stress was paid on the personal interview process. The talk also covered the judgmental aspects such as knowledge, communication skills, goal clarity, basic personality, analytical skills and consistency of the performer. The latter part of the session was quite engaging and interactive with some fun marketing and selling activities performed by certain students in order to learn better about interview skills. Further the presentation included the type of questions that are asked in an interview, and also covered frequently asked with appropriate answers to them. The session served as an advantageous value addition for the students as they buckle up important skills in their arsenal to face up the corporate world.